One of the rewards about being in the magic business is meeting people you wouldn’t ordinarily meet and going to places you wouldn’t ordinarily go to. How would a nice Jewish family in Montreal happen to have a Capuchin -Franciscan monk as a guest at one of their Passover Seders? The very same way that family attended this same Capuchin monk’s 25th Anniversary of his ordination at his seminary in Connecticut. We were friends. We became friends through magic. We meet a lot of people in magic but we don’t always become good friends. 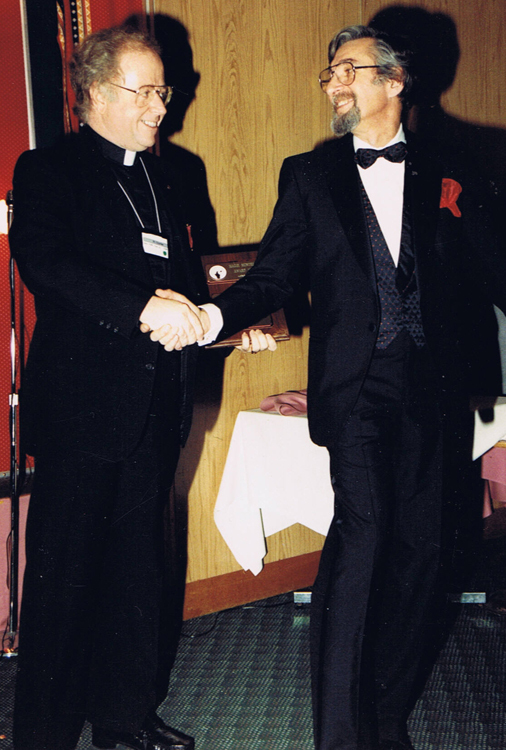 We consider Father Cyprian Murray a good friend. We shared a lot of good times together, a lot of good meals (I still remember that blue cheese salad dressing you recommended) and good wines. But he wasn’t there just for the good times. He helped us when we had personal problems as well. His advice to us was always wise. We call him Cyp. No disrespect. 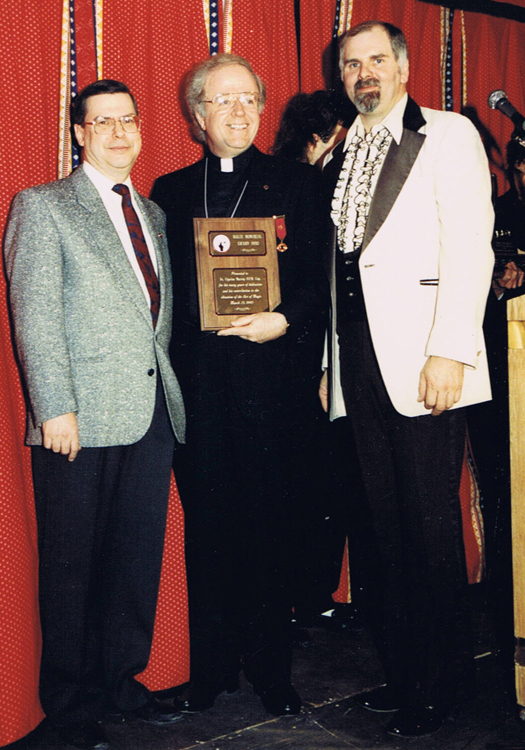 At an SAM national convention in Tampa we started a movement to get Father Cyprian to be pope. Twelve CYP for POPE buttons were made and distributed to a select few. These buttons are now collectible if you can get one of us to part with it. At the above mentioned 25th anniversary celebration Cyp requested that George Schindler be the Master of Ceremonies at the dinner party after the Church service. 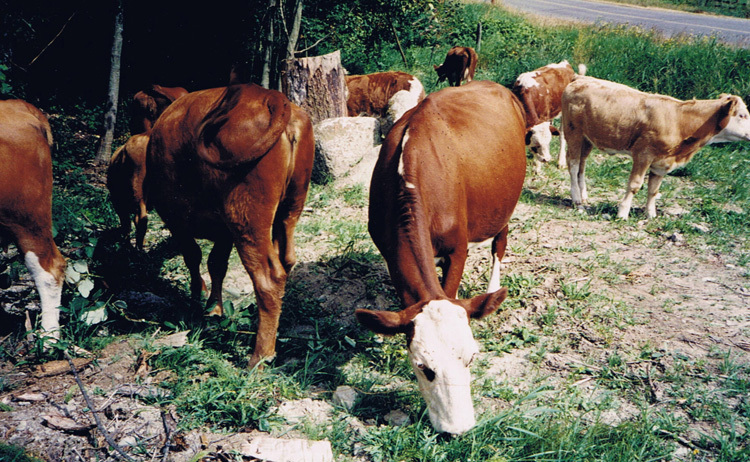 It seemed to me there were a few hundred people there, monks dressed in their brown robes, family and friends. It was in an auditorium and there was a stage and the floor of the stage was full of presents for Cyp. George got up there and said, Gee, this is just like a Bar Mitzvah. You have a service, you have a meal and you get presents, lots of presents . We only have to wait till we’re 13. You have to wait a little longer. George was at his best and the monks around us were hysterical with laughter. When Cyp got up to thank George for the tremendous job he did, he also mentioned the fact that he was running for Pope and one of his colleauges at the seminary had asked him why he got George as a manager. Cyp said, “Because I want to be Pope”! so his colleague said, “Yes, but he’s Jewish?” and Cyp said, “But I really want to be Pope”. The monks roared! It was a wonderful celebration and I remember it like it was yesterday, but it was over 25 years ago. We had the good fortune to meet up with Cyp not so long ago at George and Nina Schindler’s 50th Wedding Anniversary and we had a lot of catching up to do. attendees asked if would would hold a mass that Sunday morning and he did. Cyp! Zie gesunt! or as we say Keep Well. Hope it brought back a few wonderful memories. 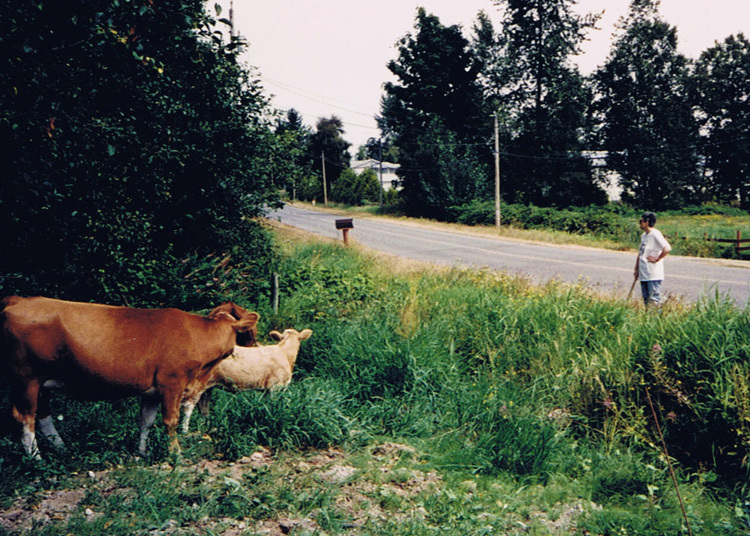 Evy keeping the cows at bay. In case we didn’t meet the Schindlers on purpose, believe it or not, we would bump into each other quite by accident on the highway. This happened at least 3 times. Once we were driving and I said “Doesn’t that guy look like George?” Phil looked over and said,”That is George!” We started honking and we both pulled over at the next rest area. Another time we stopped somewhere in New Jersey at a gas station. We hardly ever stop at the service areas but Phil was hungry so we stopped for a bite but filled up the car first. Just across from us at the next pump George was getting his car filled up. We all started screaming and George’s gas attendant couldn’t understand what was going on. We just couldn’t believe it! Again! We’ve known each other’s children since they were little. Its been a great relationship. 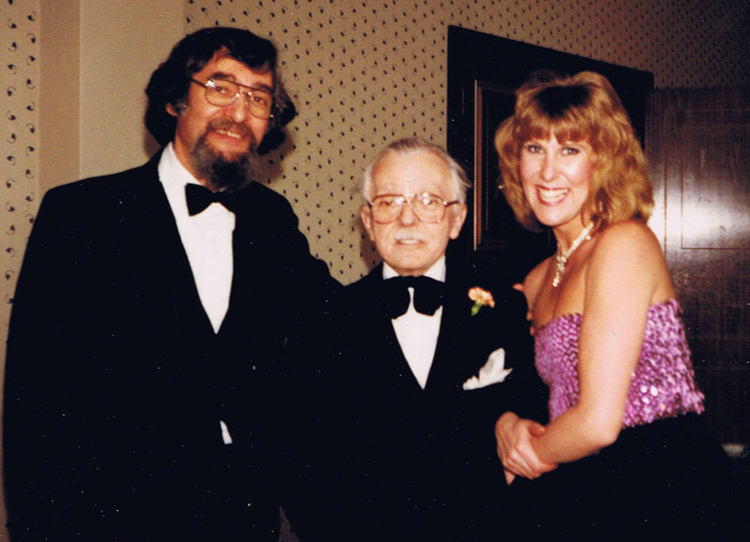 A few years back we went to George and Nina’s 50th wedding anniversary party. We felt honored that we were one of the few magician friends to be invited. about Frank Garcia. 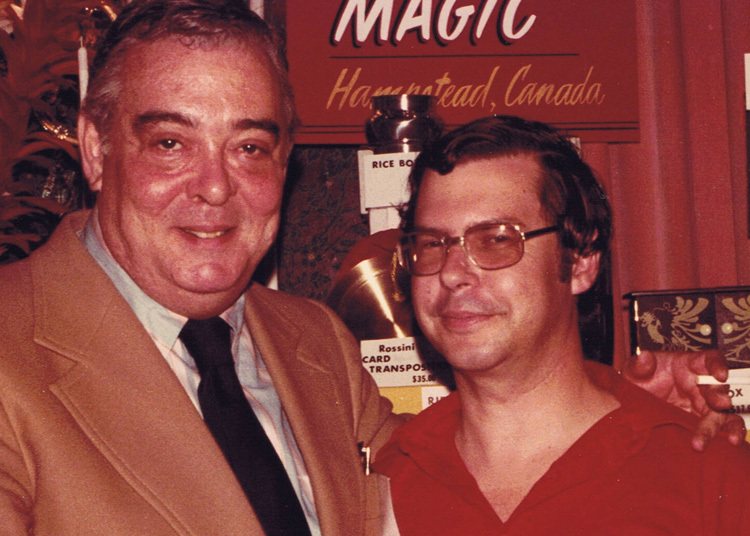 George and Frank founded the School for Magicians in New York City in 1973. 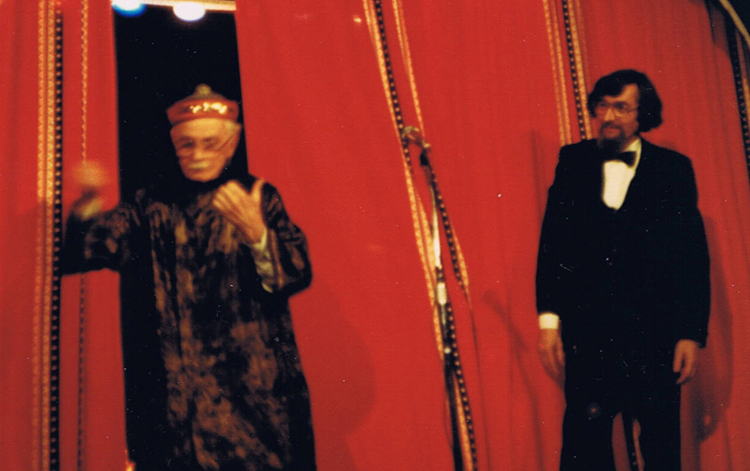 George did TV commercials and played the magician in Woody Allen’s New York Stories. 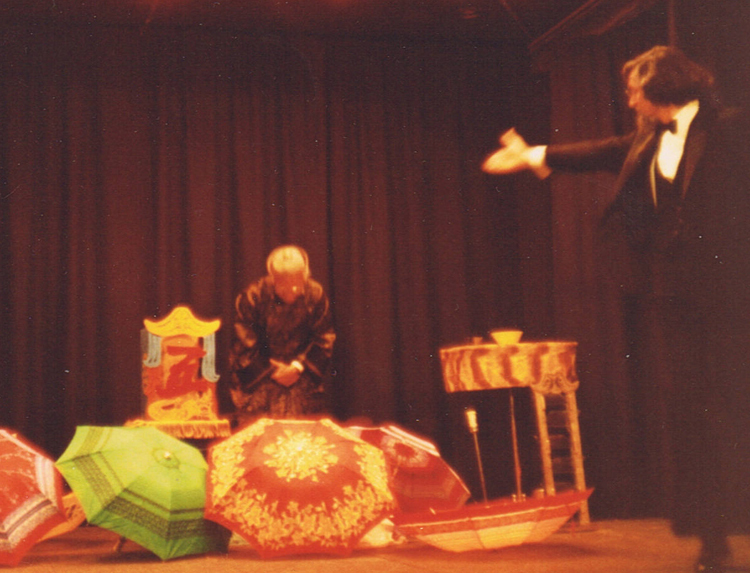 He has won numerous awards over the years and produced many magic shows. 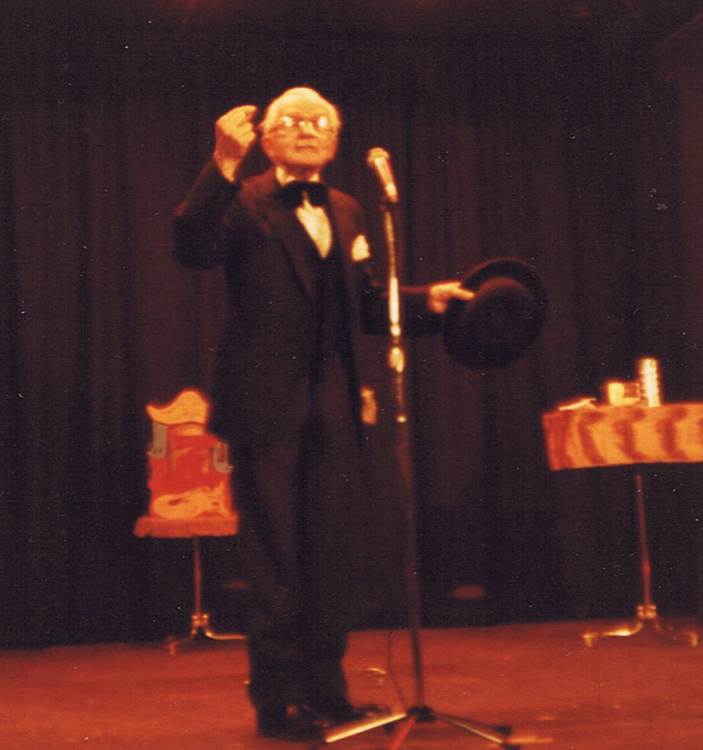 He is proficient in close-up, stage, comedy, ventriloquism, author of many books, including Magic With Cards which he co-authored with Frank Garcia. It was an excellent seller in our shop, by the way. He created several magic effects as well. On top of that he is a magic dealer in New York – Showbiz Services. 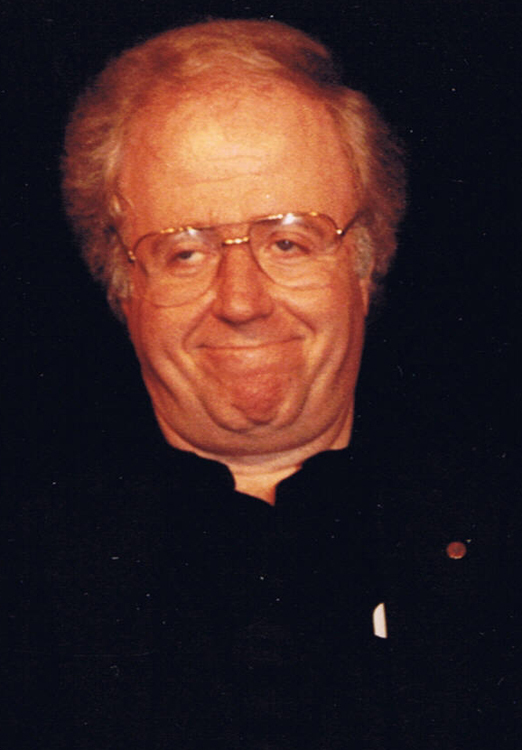 In 2005 he was named Dean of the American Magicians, by the Society of American Magicians. 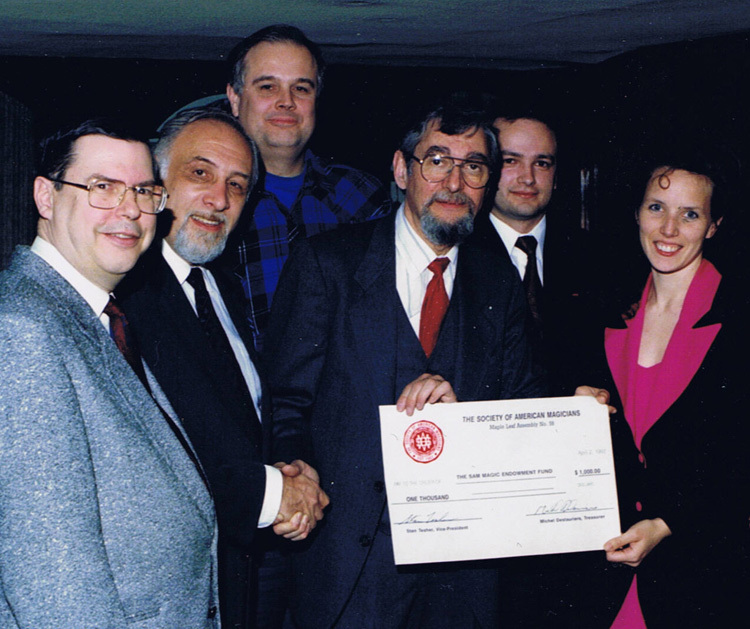 When he was President of the SAM (Society of American Magicians), George was presented with $1000.00 cheque for the Magic Endowment Fund of the SAM by the Magic Tom Auburn Montreal Assembly of the SAM at Magie Montreal. Mike Deslauriers was the President and Stan Tesher was Vice-President at the time. 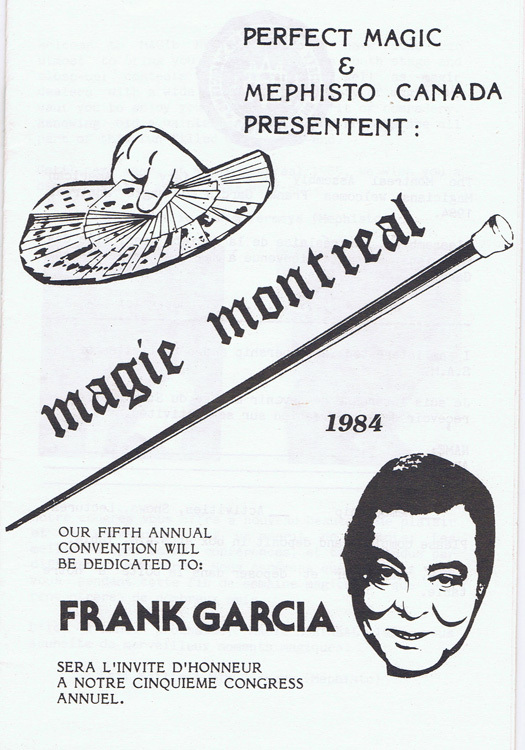 The first time Frank Garcia came to Montreal, he stayed at the Windsor Hotel, where he was to give a lecture the next day sponsored by Morrissey Magic. That first night there was a fire in the hotel and everyone was forced out onto the street in the middle of the night in their pajamas in the middle of winter. That was in the early 60’s. 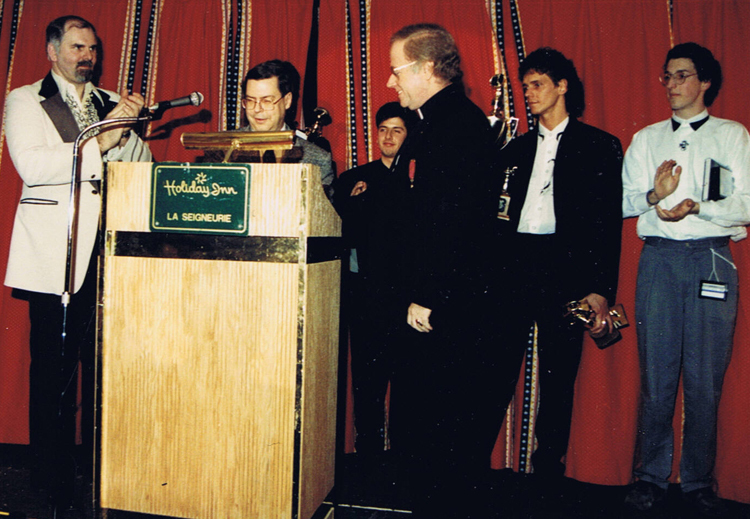 In 1984 Phil Matlin and Wim Vermeys had the honour of dedicating Magie Montreal, our 5th Magic Convention, to Frank Garcia. 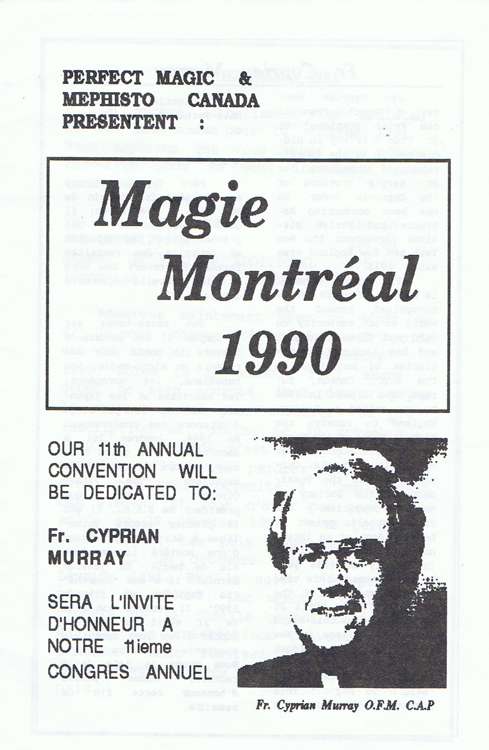 He was the turning point for Magie Montreal. Up to that point we were hardly making it. When the magicians heard that Frank Garcia was going to be there, they descending upon us en masse. There was no VHS or DVD’s at that time so if you wanted to see a legend perform you had to do it in person. If I remember correctly we had to turn people away. 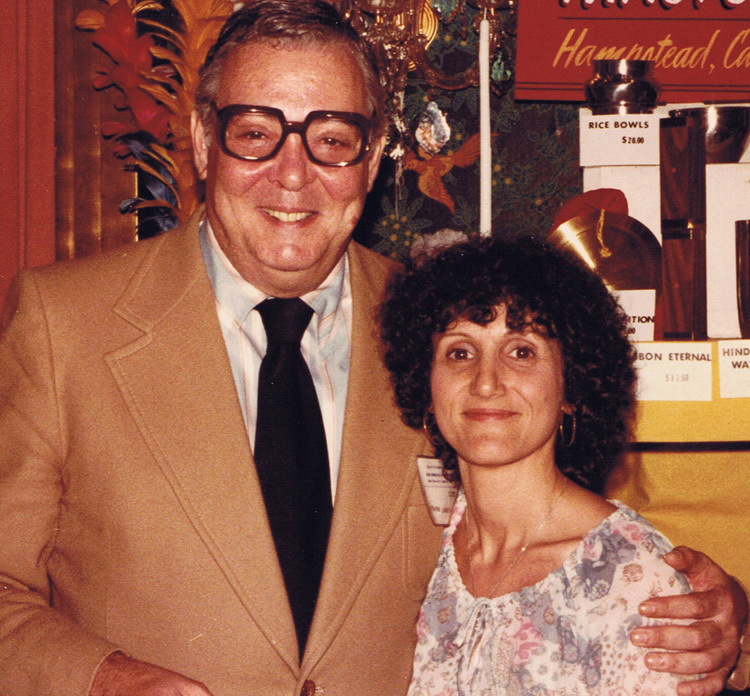 I know that many younger magicians don’t know who Frank was. When they come into our shop (Perfect Magic) and we mention something about him, they say ” I never heard of him. Is he any good? Is he on You Tube? Did he put out any DVD’s lately?” We have to laugh. 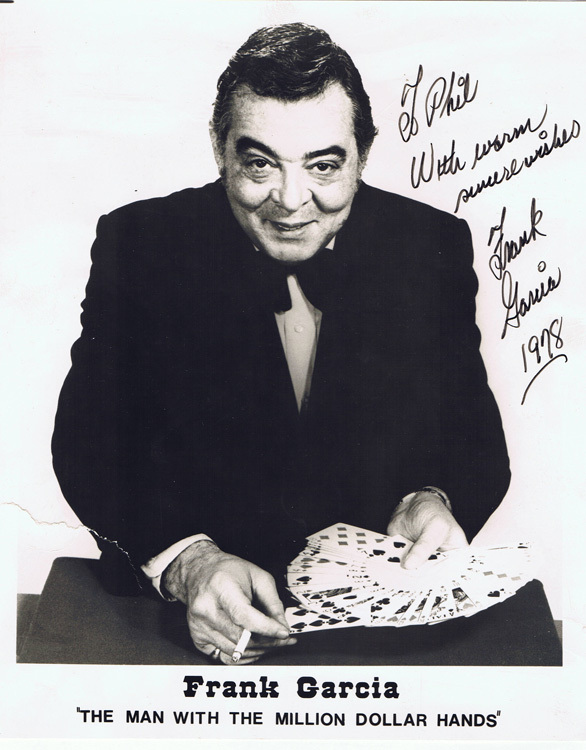 Frank was a magician and a gambler. He wrote many books on both subjects. They are collectors’ items now and hard to come by. Besides being a legend he was warm and friendly and just nice to be with. He and his girl friend Lillian, came to Montreal before the convention and spent time visiting us in our home. Romaine and Joan were with us as well. We didn’t talk about magic. He brought us a gift when he visited us. It was a round brass trivet with carved Chinese writing on it. He said it meant Good Luck. He, if anyone, would know the importance of that, being a gambler and all. 1985 Great year for Magic! 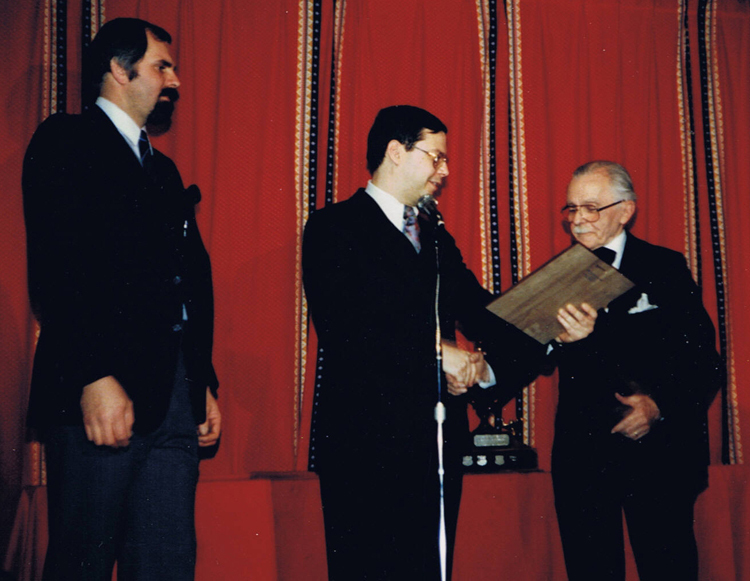 Ivano honoured at Magie Montreal! Sometimes you do something, and quite accidentally it turns into something else altogether. Two weeks ago I wrote about Women in Magic. One of the women was Shelley Carroll. I had several photos of her, but she looked the prettiest to me hanging on the the arm of Ivano, so I used that photo. The blog wasn’t about Ivano, but if any of you read the comments, there was a touching one from his grandson, who said his grandfather had died when he was 9, but he has wonderful memories of him. 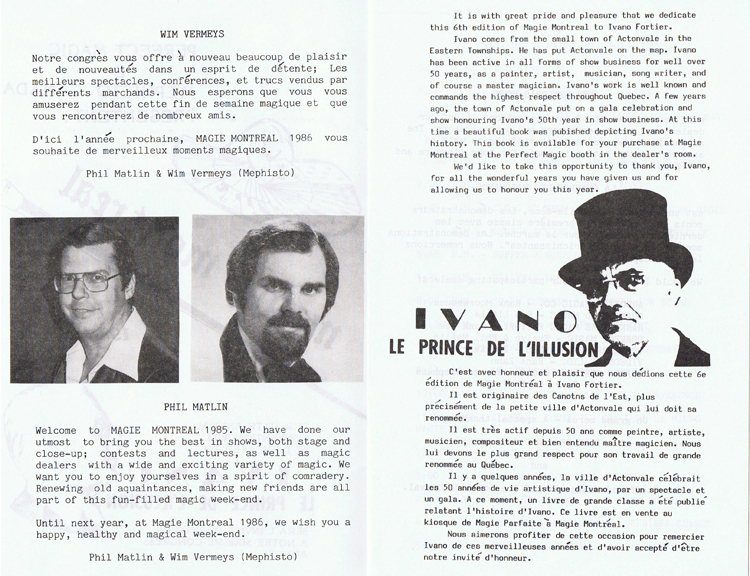 The thing that is weird about this is that I already started a blog on the year 1985 which was the year that we dedicated the convention to Ivano, who was our guest of honour that year and who performed at the convention. I was going to mention that in the blog, and continue on with other dealers, as I had started with them in an earlier blog. But the dealers will have to wait. I’m sure Ivano’s grandson will enjoy reading about his grandfather and seeing some photos. 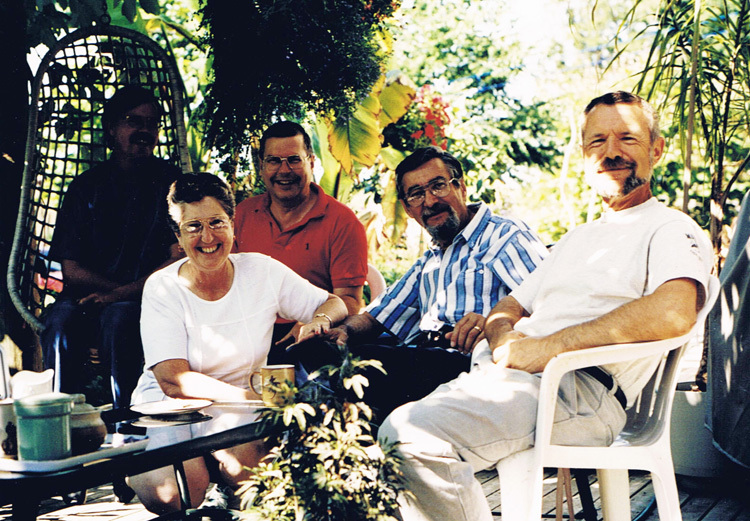 Acton-Vale is a small town in the Eastern Townships in Quebec, Canada, the home of IVANO who wrote a book in 1983 celebrating 50 years as a magician, artist, and photographer. 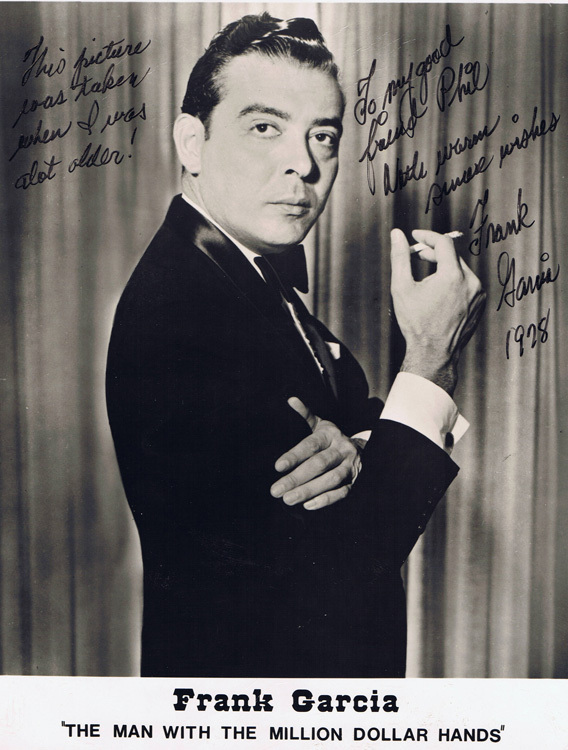 He became a member of the International Brotherhood of Magicians (IBM) in 1933. I remember the drive to the picturesque little town of Acton-Vale to meet him. Jean Prendergast was with us. He was a friend of IVANO’s and made the introductions. 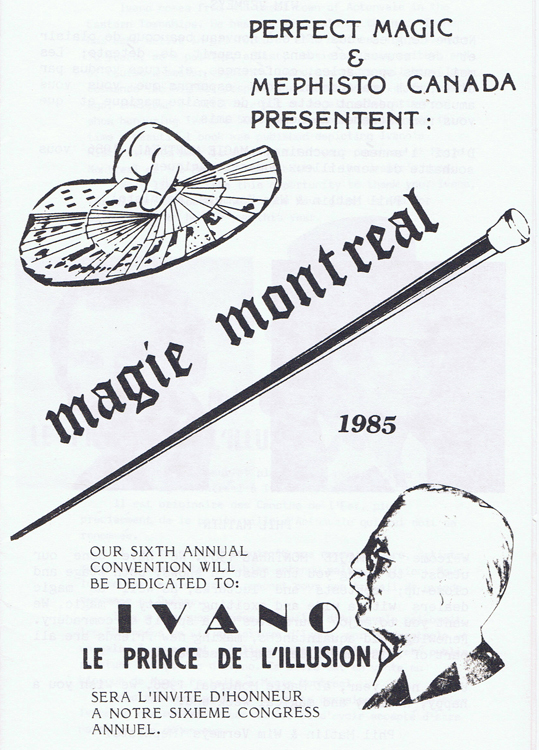 Phil asked IVANO to be the guest of honor and to perform at our next Magie Montreal convention. He was delighted by the invitation and we by his acceptance. Phil remembers him showing us his studio and especially some rag paintings. It was an enjoyable afternoon. He gave us a copy of his book which he autographed and drew a little picture of a rabbit. Sweet memories! 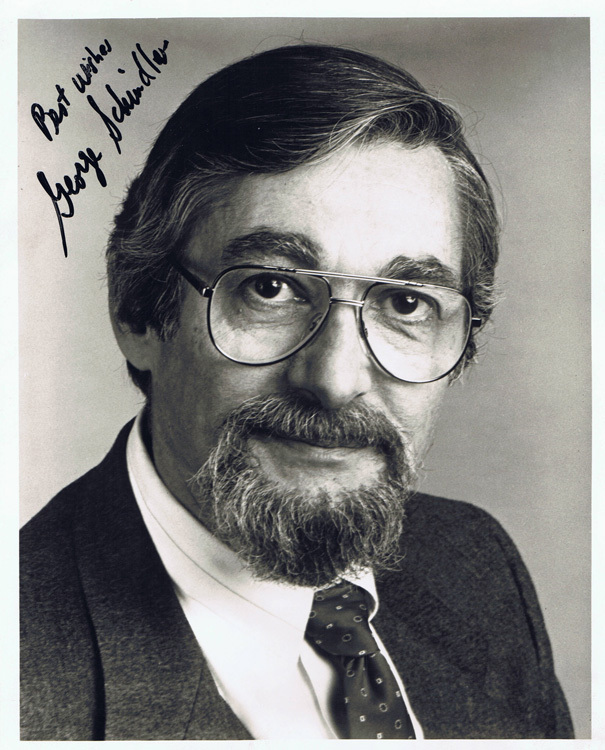 The dedication page from the 1985 progam.